German progressive tech-metallers Unprocessed have consistently put out material every 2 years since their 2012 inception. 2014’s full length debut “In Concretion” saw the Wiesbaden, Hessen crew flex their muscles with 8 minute plus songs while 2016’s “Perceptions” EP saw the band dial back slightly. Where does the 13th April release find the band? 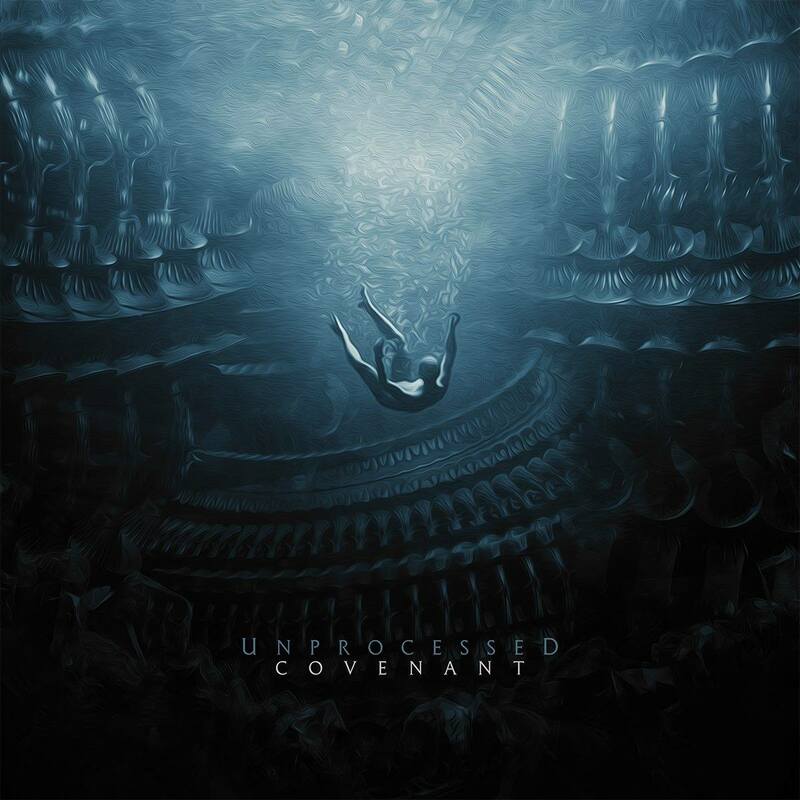 Starting with the albums title track “Covenant” and setting the tone with progressive tech-metal atmospheres overlaid by a pair of short verses from frontman and guitarist Manuel Gardner Fernandes. The first vocal lines are unclean and the second set are clean, demonstrating the full range of the frontman’s vocal powers. The depth of sound present on what is essentially an introduction impresses with synths under laying the guitars and a beautiful use of melody. “Haven” then sees the band using the kind of riffage that you would expect from genre pioneers Periphery, with that groove and bounce quality that keeps you hooked. Sonically washing over the listener in waves and neatly segmented to combine the melodic synths underpinning the chugging guitars and soaring clean vocals. The musicianship on show is incredible and the guitar solo around 3:30 only severs to build upon the epic nature of the music. “Ghilan” has the same flow between the melodic and the heavier elements of the band’s sound as they wander from the sublime to the ridiculously sublime and back again within the near 6 minute run time. Leon Pfeifer’s pounding drum work and David Levy’s bass thump underpin the sound while the trio of guitarists interplay brings it to life. The closing synths act as a pallet cleanser into heavier groove opening of “Malleale”. Layering up the guitar work with contrasting guitar tones between each of the bands trio of guitarists allows further interplay and the sheer volume of ideas going into each song even so early on in the album is a joy, while each member of the band clearly has the opportunity to express themselves. “Millenium” is the longest song of the release at 6 minutes and 30 seconds, it’s stomping, driving bass line opening with almost blast beat drumming slows up for clean vocals while maintaining the flow. Crushing unclean vocals add weight and gravity to the tracks balance while the buried electronics add a je ne sais quoi that gives the song something else every time you listen to it. There are the biggest extremes within the song and that plays to all of the bands strengths. “The Division” takes the heavier elements of the earlier tracks and builds upon their foundations. The powerful unclean vocals come to the fore as an aching female vocal layer that serves to haunt and adds to the progression and depth. It’s perhaps the heaviest of the songs on the album while maintaining the beauty of the sound. “The Mirror” sees Manuel Gardner Fernandes deliver the a vocal performance that is scarily close to the sadly departed Matt Holt of Nothingface. It’s slow burning almost classical piano introduction builds into digitally enhanced drum work and a rise and fall pattern before guitars appear in the second half. It’s probably the most straightforward track on the album but oozes quality from every pore. “Meridian” changes the pace and the tone with driving tech-metal riffage and uncleans opening up a faster song. The music then falls away for a moment of silence before bouncing back into the heavier sound underpinned by the same previously used aching female vocal buried in the background. As the song fades away an ambient electronic starts and builds the atmospherics into the start of “Exhale”. Featuring guest vocals from Vincent Schmitz of Aeons of Corruption, whose Deathcore vocals deliver a satisfying crunch over the Meshuggah-esq swirling riffage. The song has bounce, verve and energy as the band take on a heavier style of music while adding their own spin to it. It’s an absolute pile driver of a song that is perfectly placed to continue the flow of the album. “Exeunt” the shortest song in the bands release history and closes the album with an ambient electronica and the buried female vocals that had previously appeared. It’s a longer version of some of the previous ambient sections and adds a grace to close. All the releases from Unprocessed are available over at bandcamp.